Michael Tellinger shows off what could be one of the best pieces of evidence that there were giants on Earth a long, long time ago. 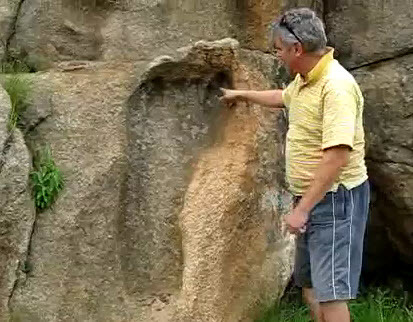 Geologists have marvelled at this giant foot print in rough granite, about 4 feet long. Some still say that it is a natural erosion pattern. Personally I find that suggestion highy improbable for various reasons that I will not go into here. Prof. Pieter Wagener from UPE, suggests that “thereis a higher probability of little green men arriving from space and licking it out with their tongues, than being created by natural erosion”. It is located in South Africa, near the town of Mpaluzi, close to the Swaziland border. It is estimated to be between 200 million and 3 Billion years old because of our current understanding of the formation of granite in Earth’s history. This dating immediately causes great debate and argument – so I urge you to keep your mind open and focused on the evidence. This amazing footprint in granite was discovered in 1912 by a hunter called Stoffel Coetzee, while hunting in the remote area. At the time this was a deeply remote part of South Africa known as the Eastern Transvaal, teeming with wild life, including antelope and lions. It remains in the same condition as it was when first discovered and the possibility that this was a carved hoax is extremely low because of its remote location. Even today, it is difficult to find. The real mystery is how this amazing phenomenon occured – I have no idea – but here it is and we cannot wish it away. YES – It is granite – it is a well recognised geological part of South Africa and recorded on all geological maps – that is why this footprint is such an incredible mystery. It can be desribed as a “phenocrystic” granite, OR coarse porphyritic granite, that underwent several different stages of cooling. The result being an interesting mixture of large and small granules. This is why granite companies are keen to mine this area for granite because it will look really “pretty” when polished. In the official Geology Of South Africa, this outcrop is called Mpuluzi Batholith (Granite) and the official dating of this rock produced dates of around 3,1 billion years. A real mystery that needs close scientific examination. Next articleActor Danny Trejo Is Opening A Vegan Taqueria In L.A.